White House Utility District (WHUD), a Matchpoint client with a dedicated leak detection team and a progressive outlook on water management, integrated Matchpoint technology with big data solutions to uncover a leak that had been mistaken as a spring. For 30 years the leak ran, etching itself into the earth, creating a mirage of an idyllic spring for local residents proclaiming it as such. The “spring” leak was a serendipitous discovery located while the utility was on the hunt for a smaller leak. Abnormal levels of midnight flow (MNF) in a District Metered Area (DMA) sent the team on the mission to locate the reason for high volume flow in the area. After tightening up the area, another leak was found surfacing and running into a stream. The leaking water main was not in the utility’s GIS system, so without notification of the smaller leak, they would have had no reason to search the area. The “spring” ran through residential land and the property owner said it had been present since they purchased the property over 30 years ago. WHUD used chlorine testing to prove the stream wasn’t a natural occurrence, and excavated the area to find a split in the 2” PVC main. The leak was estimated to be 30 gallons per minute (GPM). After the leak is repaired, the threshold for the DMA’s MNF will transcend the original threshold for the area. At the estimated leak rate, the volume of water lost over the life of the leak is estimated between a quarter of a billion to half a billion gallons of water, costing $30,000/year at $2.00/1,000 gallons of production costs. The leak has been clamped for repair and most likely will be cut away from the system. 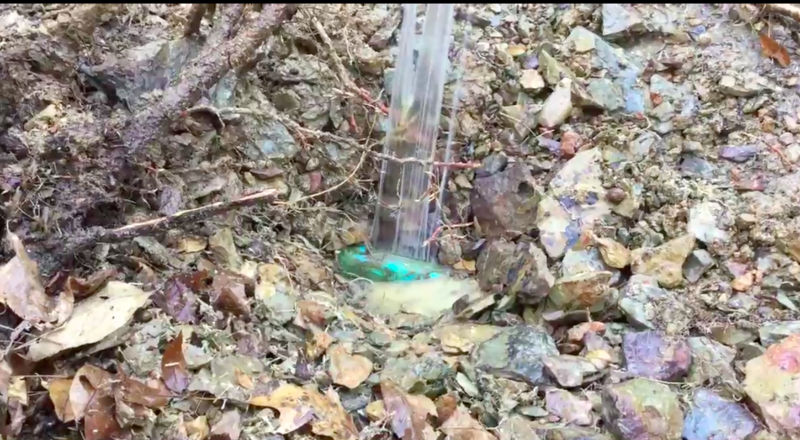 This massive leak discovery is not only a testament to the skill and dedication of WHUD, but to the importance of proactively monitoring, tracking, and analyzing water assets. WHUD utilizes Matchpoint supplied Hydrins insertion meters for their DMA program.